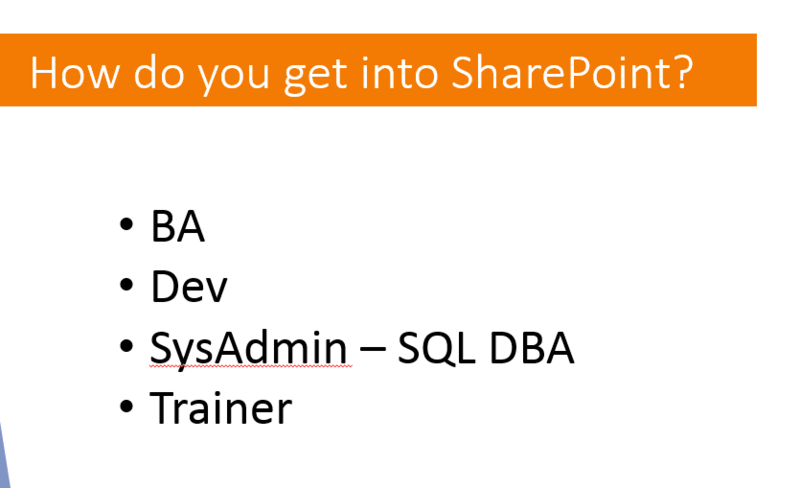 How did you get into SharePoint? During my keynote at this years SharePoint Saturday Johannesburg, (The full recap of SPSJHB will follow shortly) one of my slides started off with “How did you get into SharePoint?”. The reason i brought it up was that my journey into SharePoint and Enterprise Information Management has been a little different to the traditional way people get into SharePoint. If this is you, chances are that you did not get into it through a proper on-boarding process. AND this is where i have issues with how people get into SharePoint, which is not their fault at all. SharePoint for the longest time has been pushed through as part of “Core” Infrastructure which network and server admin’s been told to install SharePoint by their CIO/CFO/CEO’s as the product is part of their licencing package from Microsoft. I googled “I can Haz SharePoint” and the following image came up. We have all been there. Its been soo bad that Brad from GTConsult and I was going to start a YouTube channel called “SharePoint Nightmares” due to how people see SharePoint and how it gets improperly implemented in companies. So, why is this happening, what is causing it, and how do you go about fixing it. 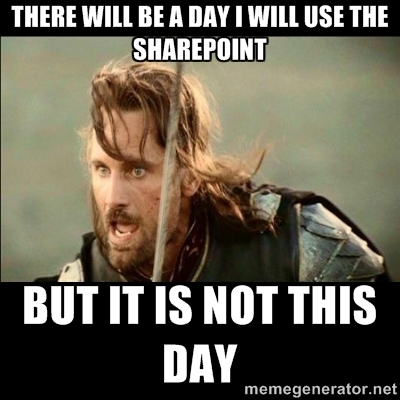 Understand why SharePoint exists. I cannot stress how super important this is. Where do you start; I recommend you starting with AIIM. Start with understanding the technologies, concepts and science behind Enterprise Information Management. Having said that, SharePoint is anything but traditional, like its competitors, OpenText, IBM and Oracle. SharePoint can be deployed in under a week, and have tangible value within a month whereas your larger, and much more expensive products take much longer as they still adhere to proper knowledge management principles, which was great in 2004 but needs to be adapted to match the requirements of business now. AIIM has moved along quite nicely in that regard. They have also created SharePoint specific course-ware and have a bunch of resource centers that are all product agnostic. If you really want to, various institutions around the country offer Knowledge Management certifications. Go through the Microsoft Virtual Academy. Search for SharePoint. There’s quite a lot of courses there to sit through. Join a community. Some are online like the SharePoint Community (it’s just a name, no affiliation to Microsoft) or get hold of your local SharePoint User Group. Attend online conferences like Collab365 or in person events like Microsoft’s Ignite (this years event has past but there is access to all the sessions) or an Office 365 Summit in your country, OR the best event in the world… Your local SharePoint Saturday. To conclude. Understand the principles behind Enterprise Information Management before you tackle a product. The product is only an enabler for improving productivity in your organisation. I’ll use the simple analogy of driving a car, first we understand how the laws work pertaining to how you would drive in your country, what side of the road, what the signs mean, etc, before you get behind the wheel of the car. The same approach should be taken when working with products like SharePoint. In the upcoming weeks, i’ll post another article around some grassroot developments that’s happening and will be kicked off soon in South Africa. I would love to hear about how you got into SharePoint so please comment or hit me up on any of my social links that can be found here.